You automatically receive a 15% discount if you purchase 2 or more patterns from my Ravelry Shop at the same time (i.e. in ONE transaction, place them all in your cart before you check out). No code needed. 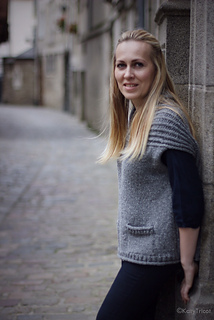 This easy vest, featuring boxy drop-shoulder styling is a one-piece design and knit continuously from back hem to front hem with no shaping and only two side seams. The drape of the lofty brioche rib, together with an interesting construction, create the beautiful curved shoulder line naturally. The comfortable slit neck opening is trimmed with a rolled edge and folds over like a shawl collar.